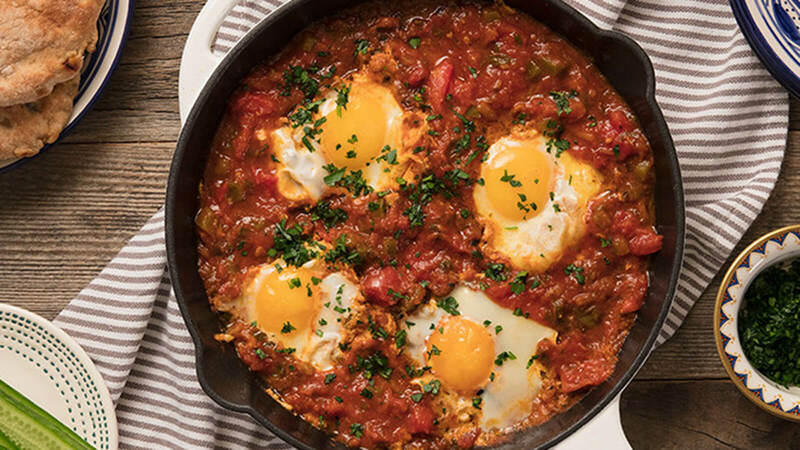 Pour Mina Shakshuka sauce in a large tagine or skillet, and simmer over medium heat for 5-10 minutes. To make spicy, add 2 tbsp of Mina Harissa and stir to combine. Once simmering, reduce heat to medium low, with just enough heat to maintain a simmer. Crack eggs over the top, cover and continue cooking for an additional 5 minutes or until egg whites are cooked and yolks are partially runny. Garnish with chopped parsley. Serve immediately with crusty bread.